A French Aubusson tapestry pillow from the 19th century, with roses decor, cording and tassels. Born in central France during the 19th century, this Aubusson pillow features a charming bouquet of pink roses, seen in a horizontal format. Their pink and white tones, contrasted with the green hue of the foliage, stand out beautifully on the cream, orange and brown accents of the background. The back is lined with a soft velvet fabric. The pillow is accented with a lovely cording on the border, adorned with petite tassels. With its sweet decor and subtle colors, this French 19th century Aubusson pillow will brighten up any sofa, canapé or settee. 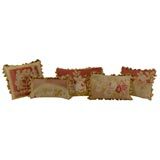 Many different pillows made from 19th century French Aubusson. We have sold 2 in the photo but have many more available for sale. Antique French Aubusson tapestry pillow, circa 19th century 649p. French Aubusson tapestry pillow, circa 18th century 1156p.